The Neonatal Intensive Care Unit (NICU) is a specialist area designed to look after and treat premature and ill babies. The NICU is equipped to deal with premature babies. The NICU staff are specially trained to care and treat premature babies. Premature babies are generally moved to the NICU once they are stabilised, they may be taken up in a Radiant Heater. What to Expect in the NICU? Once your baby has been taken up to the NICU, the staff will carry out tests and an examination. At the time parents and family are often not allowed in there, so the staff can carry out their work quickly and easily, this can take up to 90 minutes. You will be kept informed about what is happing to your baby and if any procedures are required they will discuss that will you. The NICU staff will examine their breathing and see how much oxygen they are getting. If they are having trouble breathing they may x-ray their chest to find the reason. They will take blood samples to check glucose, calcium, and bilirubin levels. They will start an Intravenous Line (IV) to ensure your baby has fluids constantly. General newborn routines will take place including a vitamin K injection to ensure there are no bleeding problems. Antibiotics will be administered to their eyes to prevent infection. 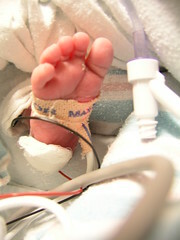 Once you get into the NICU your baby maybe attached to monitors do not be alarmed they are there to help your baby. There are a lot of machines in the NICU, read our guide to the NICU Equipment. Neonatal Nurse – They have been specially trained to look after ill and premature babies. You will see different nurses as they change shift. A Charge Nurse is the nurse in charge of the shift. A Primary Nurse will be assigned to your baby; you will see both your Primary Nurse and the Charge Nurse. Neonatal nurse practitioners – These are registered nurses who have had extra training and an advanced education. They will also have years of experience in the NICU. Neonatologist – This is a doctor that has had 3 years extra training and specialises in looking after newborn babies. You will see the Neonatologist every day. Developmental Specialists – They will work with both the NICU staff and the parents at home. They are specialists in infant development and will advise on how to improve feeding skills and how to move your baby. Social Worker – They will help you cope with the stress of having a premature baby and can give advice in a number of areas. NICU Clark – The NICU Clerk sits near the entrance to NICU and monitors who comes in and out. The staff of the NICU is there to help and advise you as well as looking after your baby, feel free to ask them any questions. Make a note as they come to you so you don’t forget. What is specifically wrong with my baby? Ask them to explain so you can understand what’s happening. What is involved with their care? How long will they be in the NICU for? What medication do they have to take and when? How is my baby being fed? How long can I stay with my baby? Will someone help me with breastfeeding? Will I be able to bottle feed my baby? What tests does my baby have to have? What care will I have to administer when we go home? Will I be given advice before I leave? Will someone becoming to my home to help? Bonding with your newborn baby is really important and especially so with a premature baby. Don’t be scared by all the machines and wires you can still bond with your child. As a parent you are generally allowed in the NICU 24 hours a day, your presence and voice will help with the bonding. If you are able to hold your baby, then try skin to skin with them. Place your baby under your top on to your skin. You may need to undo their sleepsuit if they are wearing one so your skin is touching. Keep them covered so they stay warm. If it’s possible then try breastfeeding or express and bottle feed them. If you cannot hold them in your arms, then you may be able to stroke them or hold their hand. Having a premature baby can be a scary time and the Neonatal Intensive Care Unit (NICU) can be even scarier. It’s full of machines and your baby maybe attached to monitors that you know nothing about. I’ve put together a guide to the equipment you may find in the NICU, hopefully this will answer any questions you may have and make the place a little less scary. The NICU is specially equipped to take care of premature and ill babies. Your baby’s care and needs will be met here. NICU Staff have been specially trained to look after and treat premature babies. A Radiant Warmer is a unit, which has a mattress inside for your baby to lie on and heater overhead. Newborn babies need help to regulate their body temperature, this is even more important for a preemie baby. The Radiant Warmer keeps your baby warm and also allows the NICU Staff to access them with ease to monitor and provide medical care. A premature baby is often taken to the NICU in a Radiant Warmer, later they may be transferred into an incubator. Once your baby is stable they will be moved to an incubator, which is a large Plexiglass box with a mattress inside, these are sometimes called an Isolette. An Isolette helps your baby maintain their body temperature. Some Radiant Warmers have a lid that can be closed to turn the warmer into an incubator. A Pulse Oximeter is used to measure the amount of oxygen in the baby’s blood. A small probe is placed on a baby’s wrist, finger or foot and held in place with a bandage. The readings from the Pulse Oximeter are displayed on a monitor often along with their respiratory rate, oxygen intake and heart rate. The probe is often placed on the foot of a premature baby; this may be rotated throughout the day to ensure the probe does not damage the baby’s delicate skin. A Transcutaneous Monitor measures the amount of Oxygen and Carbon Dioxide in the baby’s blood. An electrode is placed on the baby’s skin to measure this. A Heart Monitor is used to monitor the baby’s heart rate. A sensor is attached to your baby’s chest and their heart rate is displayed on a monitor, often with a reading from the Pulse Oximeter. If the baby’s heart rate goes up or down too much an alarm will sound to notify the NICU staff. The Monitor Screen is used to display readings from any monitor your baby is attached to. This includes Oxygen Saturation, heart rate and respiratory rate. If any level drops too low or go too high an alarm will sound and the NICU staff will make any adjustments they need or provide any medical care required. Any medical treatment or care you baby receives in the NICU is recorded in their computerised medical record. You will often find a computer in the NICU for the staff to update these records. A Ventilator is used to help premature babies with immature lungs breath. The Ventilator helps to regulate the mixture of oxygen, as well as the rate and pressure. A tube called an endotracheal tube is placed in the windpipe allowing the Ventilator to push oxygen into the lungs. Ventilators are programmed to fit each baby’s need; some babies need more help than others. You will find two pieces of equipment attached to the Ventilator; these are the Nitric Oxide Delivery Unit and the High Frequency Oscillator. The Nitric Oxide Delivery Unit delivers nitric oxide to the blood vessels around the lungs. This relaxes them and stops them from being damaged. The High -Frequency Oscillator helps to keep your baby’s lungs open. It shakes the air into the lungs in measured amounts, which stops any damage to the lung tissue. The Continuous Positive Airway Pressure is used when a premature baby needs some help breathing. This is often used after a baby has come off the Ventilator but will also be used if the baby needs extra help with their breathing. The CPAP provides a pressurized flow of oxygen rich air to the baby’s lungs; it helps keeps their lungs open and keeps their oxygen level stable. Two small tubes are placed into or just under the baby’s nostrils. The pressure can come from either a bubble CPAP which is a device that uses a column of water or from a ventilator. An Oxyhood is a plastic hood that is placed over a premature babies head, oxygen rich air is released. This is used for babies who can breathe unaided but need extra oxygen. A Nasal Cannula is used to blow oxygen rich air into the baby’s lungs. Two small plastic tubes are placed into the baby’s nostrils. This is another method for babies who can breathe unaided but may need extra oxygen. An Intravenous Line is a very fine line that is used to deliver medication and sometimes food to a premature baby. The line is entered in to vein this can be in the arm, leg, scalp or umbilical cord. The line is attached to a monitor that ensures the right amount of food or medication is being given to the baby. A Feeding Tube is used when a premature baby cannot be fed by either breast or bottle-feeding yet, often because they have difficulty sucking or coordinating their sucking and breathing at the same time. A small tube is passed down the nose or mouth through to the stomach so the liquid can be feed directly into it. Prem2Pram have a wide selection of premature baby clothes specifically designed to be worn by babies in the NICU. A pulse oximeter is a small device that is placed on a baby’s foot, wrist or finger and held in place using stretchy bandage, the Oximeter may be a separate monitor or part of a larger heart and lung monitor. The oximeter uses a probe that has a red light and a sensor to measure baby’s oxygen levels. As the light travels through the skin to the sensor, it measures the amount of haemoglobin that is carrying oxygen in the blood. This sensor does not harm the baby in any way. It enables the medical staff to determine whether the baby needs more or less oxygen, while reducing the need for painful blood tests. In premature babies the location of the probe is often rotated several times a day to prevent the light from damaging the premature babies very delicate skin and in preemie babies the oximeter is more likely to be placed on the foot rather than the baby’s tiny finger. Pulse oximeter readings must be accompanied by the percentage of oxygen the baby is breathing, and the baby’s respiratory rate, for the results to be meaningful, therefore the device is often connected to a medical monitor so staff can see the baby’s oxygenation at all times. Most monitors also display the baby’s heart rate. Premature babies in NICU who have a Pulse Oximeter fitted to their foot might required footless sleepsuits, these can be purchased from Prem2Pram and are available in pink or blue stripped teddy bear fabric or plain white which can be personalised with baby’s name.